So… it’s been a Good News/Bad News kind of a day in Toddlerville. Good News: #Frankenfoot got her stitches out & that means I’m just a day or so away from a full on proper shower (with Hubs standing by)! Everything is healing really well & the x-rays look super good. Bad News: Because everything looks so nice & I’m doing a great job at taking care of it the doc wants me to stay on the #StupidCrutches the full 4 weeks. That means I can stop using them at home on May 1st (if I fudge by 36 hours). And then, maybe, after the visit to her the following Tuesday (May 6th) I can lose the crutches all together. Good News: Walking (hopping) home from the doctor I got to see all the lovely Spring flowers. 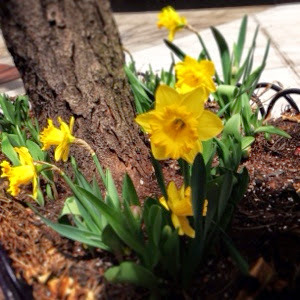 Including these daffodils, which are one of my all time favorite of flowers. Bad News: When I got to my building I was knocked off my crutches & nearly fell down the steps to the sidewalk by someone who was trying to be kind. So I was nearly killed by kindness. Good News: I waited in the lobby to see Hubs & he agreed to pick up a venti frap on his way back from the grocery store so I could drown my sorrows. Bad News: When I got into the apartment my kids were clearly tired but keyed up; no one was listening. In utter frustration I sent them for quiet time over an hour early. I want to cry. I’m tired of not being able to do anything. I don’t want to keep hopping around like a manic flamingo. My kids and my Hubs are sick of it too. We all have Spring Fever, and we want to go roll in the grass like happy puppies. Here’s the thing; days like today I don’t want to be the parent. I want to be the child. I want my mother to bring me a special treat – like orange juice & ginger ale – and coloring books. And sit with me and watch old movies. I want my dad to go to the grocery store to pick up something fun for dinner & see flowers or balloons or a stuffed toy that he picks up to make me smile – just to make his little girl feel better. But Mom’s been gone 10 years now. And Daddy lives in Texas, while I’m up here in the Big Apple. The reality is that I’m the Mommy now. My little people need me to be the grown-up. ← FrankenFoot as a Harbinger of Spring? The moments when I wish I was a kid the most is when my lower back starts to hurt, or I need some kind of energy to through the day. Good news: Im working out so the back pain will someday be no longer. Bad news: The coffee I need for the energy, is not working like it use to. Have a great day. “Days like today I don't want to be the parent. I want to be the child. I want my mother to bring me a special treat.” I've felt that way before too. Yes to the serenity prayer. I need to say that one more often.